Craig Altobello will be having a marquetry art show at the Putnam Gallery at Dublin School from February 8th through March 7th. The show is open to the public. On February 15th from 5-7 PM, there will be an exhibit opening for students and the public. On February 8th, Mr. Altobello will give a Morning meeting talk about his art and meet afterward with several woodworking classes. 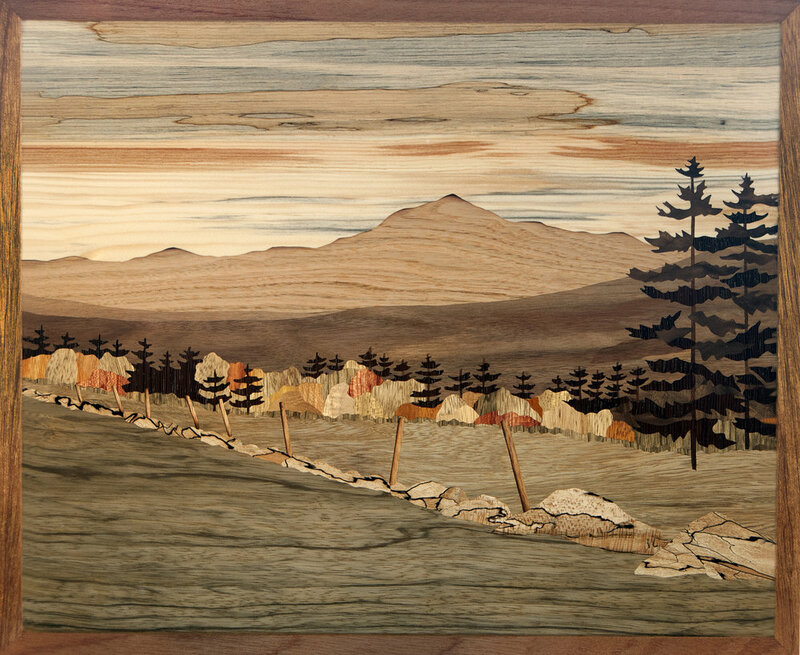 Craig Altobello, of Peterborough, NH was a hobby woodworker for decades before getting inspired by marquetry, a wood inlay technique of piecing together thin wood cutouts into beautiful, multi-shaded images. A former science teacher, Altobello uses close observations of the natural world to provide his subject matter. The exhibit includes panels explaining the process of making his marquetry art. Craig uses the grain, texture, and natural color of wood to create images from nature. For this exhibit, Craig combines his love of outdoor rambling with artwork that captures both the adventure and natural history of Acadia National Park, Mt. Monadnock, and the White Mountains of New Hampshire. His colorful wood panels are created primarily from North American woods and include landscapes, birds, flowers, mammals, AMC huts, rock cairns, and dramatic skies. Craig is a juried member of the League of New Hampshire Craftsmen and Sharon Arts Center.